Kaliningrad (Russian: Калинингра́д kuh-leen-een-GRAHD) , also known by its original German name, Königsberg, is the capital city of Kaliningrad Oblast in Russia. It has about 450,000 inhabitants. It is also called 'Karaliaucius' in Lithuanian, as Lithuanians (cousins to the 'Old Prussians') used to live there. So it is truly the 'City of the Four K s: Kaliningrad / Königsberg / Krolewiec / Karalaucius '. Following the Second World War, it was briefly known as Kyonigsberg (Кёнигсберг), the Russified form of the original German name. Kaliningrad was a hub for science and culture whizzes from Germany, Poland and Lithuania. In-fact the famous mathematical Königsberg bridge problem is based in the city. 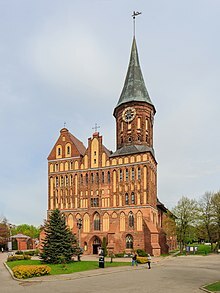 Kaliningrad is also home to renowned philosopher Immanuel Kant and prominent German writer Ernst Theodor Amadeus Hoffmann. Kant is said to have had such pride in his hometown that he barely left the place in his lifetime, declaring that he did not need to venture abroad because ships came and brought people to tell him stories. The best time to visit is in summer between June and August, when the temperature is around 20 to 25 deg C. Temperatures in autumn range from 10 to 15 deg C and the season lasts from September to November. The Kaliningrad winter, which is from December to February, is much milder winter than Russia, with temperatures from 5 deg C to minus 11 deg C.
As Kaliningrad is an exclave of the Russian Federation, almost all visitors require a Russian visa to enter. If you plan to travel overland between Kaliningrad and other parts of Russia, you will need at least a double-entry visa in order to exit and re-enter Russia. Travelling by air on domestic flights between Kaliningrad and Moscow or St. Petersburg can be done even with a single-entry visa. For more information about Russian visas, see the visa section on the Russia page. 54.8920.59251 Khrabrovo Airport ((Аэропорт Храброво) KGD IATA) (16 km (9.9 mi) away from Kaliningrad). A regular bus (144) is going every hour from the terminal to various stops in the city centre for RUB33. Taxi service is also available; If you know the exact address, ordering a cab via mobile apps called Taxi Maxim or Rutaxi (that both have English language option and, by the way, work in a number of other Russian regional centers) can save you approx.10% in comparison with prices of airport cab services. The official airport taxi services that are represented in the arrival area with a couple of counters, charge a fixed price of RUB600-1000 to get from the airport to any point in the city; other cab companies might charge even more. Long-distance trains leaving from Kaliningrad run on Moscow time, an hour ahead of the local time. Thus a train advertised as leaving at 6:30PM actually leaves at 5:30PM local time. Comedian Yakov Smirnoff might have said, "In Soviet Russia trains are on time, you are late" Clocks at stations use Moscow time. Just to confuse things, local trains run on local time. After witnessing this system, you will no doubt understand that the railways were one of the driving forces for standardized time-zones throughout Europe. East-bound (towards Vilnius in Lithuania) long-distance trains still run regularly. Departures are daily from Moscow (22 h) via Minsk (11 h) and every two days from Saint Petersburg (26 h, also via Minsk). Some services are available from Chelyabinsk (69 h) in the Urals and Homel (via Minsk). There's also trains from the Black Sea resort, such as Sochi (61 h), expect 1-2 trains a week during summer. All cross-border services across the Polish border have unfortunately been cancelled. 54.69457120.4985062 Kaliningrad-Passazhirsky (Калининград-Пассажирский), sometimes called Kaliningrad South, is the main railway station and is located at ul. Zheleznodorozhnaya, 15. The road system is extensive in the Kaliningrad region; however, they are not always well-maintained, and sometimes it is hard to get around because of absence of signage indicating directions/destinations (especially in the city). Driving rules are generally the same as in most European countries, but many do not follow the rules, especially during rush hour in the city. Beware of the traffic police because they like to stop foreigners and often expect bribes. There are two ways to get to Kaliningrad by car - from Poland and from Lithuania, but you should expect delays on the borders (sometimes it can take a couple of hours)! The green card for insurance has been valid since beginning of 2009. Bus time tables for international and regional buses (in English), see: here or at the site of Kaliningrad's central bus station (ulitsa Zheleznodorozhnaya, 7 - next to the South train station), which, besides that, also serves a number of regional lines. Bus to/from Warsaw - leaves Warszawa Zachodnia bus station at 8:00 Mon, Wed, Thu-Sat, tickets RUB1520. On Tue and Sat there is another bus that leaves Warszawa Zachodnia at 13:00, the ticket costs RUB1200. City has bus, minibus, trolleybus, and tram networks. The best way to explore the city is by bus. The public transportation system is very good. Half of the population live in the city, hence it is very well-connected. Fares are kept low, at a flat rate of RUB20 on the bus and the waiting time is short. Tickets on the buses are handed out by the conductors. Taxis within the city may have meters, but most prefer to negotiate fares in advance. Minimum charge within the city is at least RUB100, even for short distances. 54.70638920.5116671 The old cathedral of Königsberg, Kanta 1 (Easily approachable by foot either from the direction of the Kaliningrad Hotel (take the left side of the Leninsky Prospekt auto bridge south, and descend the stairs when the cathedral appears on your left) or from the direction of the Fish Village), ☎ +7 4012 63-17-05. 9AM to 5PM. Founded in 1333, largely reconstructed after World War II, the cathedral on Kneiphof Island along the Pregolya River is a sight to see. The cathedral links Kaliningrad to its German past, as it is where the Prussian kings were once crowned. There are two rooms in the Cathedral Museum devoted to the life of Kant, whose tomb lies beside the cathedral walls. Up the stairs to the left of the main door is a three-story museum dedicated to the life and work of Immanuel Kant (separate ticket needed). Kant's grave can be viewed outside the cathedral, on the northeast corner of the building. RUB270. 54.70975620.5124722 The House of Soviets. Known to locals as 'The Monster,' this is sort of an anti-attraction, but useful for orientation in the city center. It was constructed on the ruins of the Königsberg Castle, but was deemed structurally unsound and therefore never occupied. Rumor has it that a mysterious owner prevents it from being demolished. An archaeological dig is active on the grounds, which is not open to tourists, but specialists may be able to arrange for a visit of the remains of the castle. The old fortifications. From approx. 1860-70, they include 15 town gates - Sackheim, King's, Rossgarten, Attack, Railway, Brandenburg, Friedland, Friedrich Wilhelm III. One of the towers is home to the Amber Museum. Fishing Village. Red-roofed buildings and colourful exteriors illustrate the charm of old Koenigsberg, what Kaliningrad used to be known as. 54.72007220.5007243 Victory Square. The central area where the administrative buildings, banks and shops are. 54.72236120.5233785 Amber Museum, Marshal Vasilevsky Square 1 (In the Dohna Tower of the city wall), ☎ +7 4012 46 68 88, fax: +7 (4012) 46 65 50, e-mail: ambermuseum@bds.ru. 10AM to 7PM, daily except Monday. Houses a large number of amber ornaments and jewellery from Yantarny in the wider Kaliningrad region. RUB90. Bunker Museum, Universitetskaya 2 (Enter the first courtyard to the right behind the Kaliningrad Hotel). daily except Wednesday, 10AM to 4PM. A bit hard to find (one must weave through three or four courtyards and children's playgrounds before finding it, which is barely marked except by two black upright triangular canopies over the bunker doors), it was the headquarters of the local German command during the 1945 battle. A museum of the city's German past (which lasted 689 years) and Soviet "liberation" of the city, including several interesting dioramas of events during the days of the battle. RUB50. Immanuel Kant Museum (Kneiphof island). 54.72236120.5233786 Museum of the World Ocean, Nab. Petra Velikovo 1, ☎ +7 4012 53 89 15, e-mail: postmaster@vitiaz.koenig.su. 11AM to 6PM, Wed-Sun. Includes two museum ships and one submarine. 54.7137520.5185227 Kaliningrad Regional Museum of History and Arts, Klinicheskaya 21. 10.00 – 18.00; closed: Monday. The main building was once the Stadthalle, Königsberg's performing arts centre. Branches include Bunker Museum, Fort 5 «King Frederick Wilhelm III», open air «Koenigsberg Castle» and Park of Sculpture. Walk the bridges - The seven bridges of Königsberg linked the two islands and the banks of the Pregel River. Proving the impossibility of there being a route that crosses each bridge exactly once led Euler to important discoveries in mathematical graph theory. Königsberg became Kaliningrad, the Pregel became the Pregolya, two of the bridges were bombed in WWII, two were demolished and replaced with a highway called Lenin, and one was rebuilt in 1935. Now there are five bridges, the problem is solvable. Try it! Kaliningrad's annual two-day City Day. Commemorates its founding since 1255. It is celebrated in September. The city comes out in full force to party under the dazzling fireworks, concerts, performances, sports, arts and car-related events. Watch football at Kaliningrad Stadium, built in 2018 to host group games of the FIFA World Cup. It's home to FC Baltika Kaliningrad, who play in the Russian National Football League (also called the First Division, ie the second tier of Russian football.) The stadium is two-tiered, with a design modelled on the Allianz Stadium in Munich. Its capacity for the World Cup was 35,000, but this is to be reduced to 25,000. It's sited 2 km east of city centre on Oktyabrsky Island, a long marshy island in the River Pregolya. So it's walkable from the centre, or take tram 5 or bus 40 or 72 and get off at Veteranov. The football team formerly played at Baltika Stadium north-east of the centre: this is a multipurpose stadium of capacity 14,600 but its future main use has not been announced. Europa shopping mall, Ploshad Pobedy, 2A Victory Square (Train to Severnyy vokzal), ☎ +7 8 4012 21-08-23. 66,000 m2 of high-end boutiques, cinemas, food and beverage outlets ranging from fine-dining restaurants, cosy cafes to cheap food kiosks. Viktoriya Supermarket, Leninsky Prospekt 30 (Ground floor of the Plaza Center). A 24-hour supermarket, useful for self-caterers. Other locations throughout the city, too. [dead link] Kaliningrad Amber Factory, Ul. Chernyakhovskovo 62 (also other locations in the city), ☎ +7 8 4012 53 05 45, e-mail: yantar@baltnet.ru. Factory store offering a wide variety of jewelry and objets d'art for almost any budget. Amber pavilion (A few blocks up Leninsky Prospekt from the Kaliningrad Hotel). opens at 10AM. Several stores grouped together with a variety of amber items at competitive prices. Yantarny, Information tourist center «Gorod Vdohnoveniya», Masterov Square, Yantarny settlement (Located an hour's drive from the city), ☎ +7 8-911-462-79-59- 8-911-462-79-59, e-mail: itcyantarniy@mail.ru. Yantarny has the biggest amber mine in the world and accounts for more than 90 per cent of the world's output. This settlement has a wide variety of amber products. Amber Museum's gift shop, 1, Marshal Vasilevsky square, ☎ +7 8 4012 46 68 88, +7 8 4012 46 65 50, e-mail: ambermuseum@mail.ru. You can buy a piece of amber from RUB240. Papasha Beppe Pizzaria, Leninsky Pr. 20/26 and Baltiiskaya Ul. 12. 11AM to 11PM. Many locals consider this to be the best thin crust and thick crust pizza in town, also a wide variety of salads, pastas, risottos, and desserts. RUB200-600 per pizza. Karamel, Leninsky Prospekt 30 (On the top floor of the Plaza Center; note the separate elevator to the right of the main entrance to the shopping mall. ), ☎ +7 4012 53-04-61. Some of the best views from the city from this cafe. Excellent food and fairly broad range of European cuisine, approximately RUB500 per entree. Razgulyai, Ploshad' Pobedy 1, ☎ +7 4012 533-689. Cafeteria-style restaurant with rustic decor. Good for children. Solyanka Cafe, 24 Prospect Mira, ☎ +7 4012-936-203. Try the solyanka, a thick, piquant soup that is either meat-based, fish-based or vegetable-based. It is cooked with preserved cucumbers, olives, capers and tomato puree that give a strong sour-salty taste to the soup. Solyanka is perhaps one of the most popular soups besides borscht (beetroot soup) in Russia, but remains unknown beyond the national boundaries. RUB500. Zarya, Prospekt Mira 41/43 (Just up the street from the Moscow Hotel), ☎ +7 4012 21-39-29. A trendy, upscale restaurant with indoor and outdoor seating, wide selection on the menu, excellent desserts. In the same building as a movie theater. Steindamm 99, Zhitomirskaya ulitsa, 22, ☎ +7 (401) 238-84-70. 11-23, Fri-Sun 12-23. Well-designed interior, good service, fairly priced lunch menu on weekdays. RUB600-800. Twelve Chairs (Dvenadstat' Stulyev). A very chic bohemian style cafe with a decent food menu. In the Shadows of the Castle (V Teni Zamka) (In the strip mall across from the Kaliningrad Hotel). opens at 11AM. One of Kaliningrad's longest-lasting cafes. Local beer brands that are available in stores include Ostmark and Königsberg. Hmel Restaurant and Brewery, Pobedi Square, 10 ('Klover' Shopping Centre, 2nd Floor), ☎ +7 4012-593-377. Live music starts at 9PM every night. A gigantic brewery on the second floor churns out home-made beer. RUB95/glass. Kropotkin, Teatralnaya ulitsa 30 (next to the big McDonald's near Victory Square), ☎ +7 401 266 8060. Self-made beer (RUB100 0.5 liters (0.11 imp gal; 0.13 U.S. gal)), probably the best in town. Try the unfiltered one. Acceptable food, cosy beerhall atmosphere and business lunch. RUB400. Komnata Otdyha (Комната Отдыха), Inside the main train station (follow the Комната Отдыха signs). The station offers rooms and small dorms. You do not need to show a rail ticket to stay. A good budget option, especially if arriving late. RUB500-1500. Armenia (Honourary Consulate), Kievskaya street, 23, ☎ +7 4012 681-083, +7 4012 680-022. Croatia (General Consulate), Dzherzhinskogo street, 244-A, ☎ +7 4012 60-05-55, fax: +7 (4012) 60-05-56. Denmark (Honourary Consulate), Proletarskaya street, 133, ☎ +7 4012 95-76-88. Germany (General Consulate), Leningradskaya street, 4, ☎ +7 (4012) 920-218 (short-term visas), +7 (4012) 920-220 (admission), +7 (4012) 920-219 (national visas), fax: +7 (4012) 920-229, e-mail: info@kaliningrad.diplo.de. Mon-Thu, 9AM-5PM; Fri 9AM-2PM. Greece (Honourary Consulate), Ogareva street, 33, ☎ +7 4012 93-60-27, e-mail: scherbakov@avtotor.ru. Italy (Honourary Consulate), Chernyakhovskogo street, 6 office 108, ☎ +7 4012 53-24-32, fax: +7 (4012) 53-24-32, e-mail: consolatokaliningrad@yandex.ru. Latvia (General Consulate), Engels street, 52-а, ☎ +7 921 107-4224, +7 411 270-6755, +7 401 256-5502, +7 8 4012 295-7441, fax: +7 (921) 232-9750, e-mail: chancery.kaliningrad@mfa.gov.lv. Mon-Fri, 9AM-6PM. Lithuania (General Consulate), Proletarskaya street, 133, ☎ +7 4012 95-7688, +7 4012 95-9486, fax: +7 (4012) 95-6838, e-mail: kons.kaliningradas@urm.lt. Mon-Fri, 8-30 - 12-30. Netherlands (Representation at the General Consulate of Sweden), Kutuzova street, 29, ☎ +7 4012 959-400, fax: +7 (4012) 959-433, e-mail: generalkonsulat.kaliningrad@foreign.ministry.se. Mon, Tue, Thu, Fri, 9-00 - 12-00. Norway (Honourary Consulate at the General Consulate of Poland), Kashtanovaya Alley, 51, ☎ +7 (4012) 976-440, +7 (4012) 218-741 (visa issues), fax: +7 (4012) 976-443, e-mail: consulat@kaliningrad.polemb.net. Mon-Fri, 8-30AM - 1-00PM. Poland (General Consulate), Kashtanovaya Alley, 51, ☎ +7 (4012) 976-440, +7 (4012) 218-741 (visa issues), fax: +7 (4012) 976-443, e-mail: consulat@kaliningrad.polemb.net. Mon-Fri, 9-00AM - 2-00PM. Estonia (Estonian visa service provided by the Consulate of Lithuania), Proletarskaya street, 133, ☎ +7 4012 95-7688, +7 4012 95-9486, fax: +7 (4012) 95-6838, e-mail: kons.kaliningradas@urm.lt. Mon-Fri, 8-30 - 12-30. Hungary and Slovenia (Hungarian and Slovenian visa service provided by the Consulate of Latvia), Engels street, 52-а, ☎ +7 921 107-4224, +7 411 270-6755, +7 401 256-5502, +7 8 4012 295-7441, fax: +7 (921) 232-9750, e-mail: chancery.kaliningrad@mfa.gov.lv. Mon-Fri, 9AM-6PM. Sweden (Swedish visa service provided by the Consulate of Poland), Kashtanovaya Alley, 51, ☎ +7 (4012) 976-440, +7 (4012) 218-741 (visa issues), fax: +7 (4012) 976-443, e-mail: consulat@kaliningrad.polemb.net. Mon-Fri, 9AM - 2PM. Curonian Spit A nearly 50-km-long spit stretching between Zelenogradsk and the Lithuanian border, separating the Baltic Sea from the Curonian Bay, it includes pine forest, hiking paths (beware of encephalitis-bearing ticks), and beaches. The average height of the sand dunes is 35m, with some reaching to 70m high. Entry fees are RUB30 per person, plus RUB200 per car. The entire spit, including the Lithuanian part, is a world heritage site. This city travel guide to Kaliningrad is a usable article. It has information on how to get there and on restaurants and hotels. An adventurous person could use this article, but please feel free to improve it by editing the page.